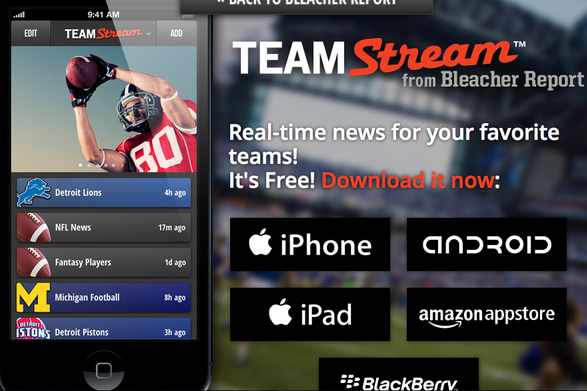 Bleacher Report - Bleacher Report keeps you up to date on the latest sports news, scores, games, and highlights. With the free app available on Iphone, android, blackberry, Ipad, and amazon app store devices, you can stay up to date with all the latest games on the go. CBS Sports - Gives you extensive coverage on all your sports teams. You get the latest news, scores, and live viewings of the games right from the webpage. Deadspin - This sports blog gives you the latest in sports news. It keeps you in touch with the rumors, the facts, the hard-hitting news. This blog has it all. This blog is much more laid back than any of the news sites you will visit today. it gives more opinions and more words you wouldn't see on TV or on the network sites, but it is honest, real, and funny for those looking for something more in their sports news. ESPN - Comprehensive coverage and news about almost every sport. ESPN Films: 30 for 30 - ESPN Films is proud to present its Emmy-nominated documentary series 30 for 30, and its 30-part digital short film series. 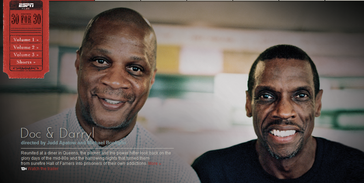 30 for 30 Shorts is similar to the feature-length films in that each piece represents a specific point of view of the filmmaker and is a reflection of how they blend the narrative with their own visual style. The idea behind 30 for 30 was to commemorate ESPN's 30th anniversary by producing 30 films from some of today's finest directors. Each filmmaker brought their passion and personal point of view to each film, detailing the issues, trends, athletes, teams, rivalries, games and events that transformed the sports landscape from 1979 to today. FanSided - We’re the network for fans! Nowhere else will you find the edgy, educated, and candid “fanpinions” that the FanSided Network dishes out each and every day, all year round. Fandom has no offseason. Neither do we. Sports and entertainment aren’t our jobs. Sports and entertainment are our lives. 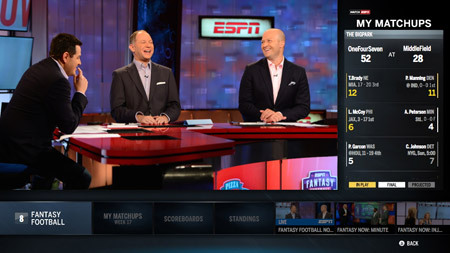 Fox Sports - Through the FOX network, you can experience Fox Sports online from anywhere. With their Big Board, you can catch all the latest scores of games happening everywhere. NBC Sports - Catch the top stories happening in the sports world. Watch live games, highlights and clips. NBC Sports also gives you access to Sports World, which opens up more into the world of sports. Jalen Rose and David Jacoby - This YouTube podcast Pop The Trunk gives you the latest news and opinions from Jalen Rose and David Jacoby. Get daily podcasts from a retired professional basketball player that keep you up to date on sport's news. This podcast is great for anyone looking to hear some information instead of just read it. Rant Sports - Get the latest in sports news on this site. It started out being 155 sport blogs merged to create Rant Sports and now it has grown to be a large community of blogs where you can keep up on sports going on in any state, country etc. 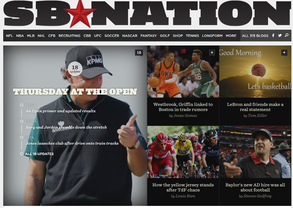 SB Nation - SB Nation is the fastest-growing sports media brand on the web, featuring national sports coverage alongside more than 300 community sites ranging from college football teams to MMA and OutSports. Where there's a sport, there's a fan — and SB Nation is determined to empower the biased, passionate, and obsessed voices among all of them. Sporting News - Catch what is trending in sports news and find out the latest in draft picks, tradings, and player injuries right from the home page. Sports Illustrated - The internet side of Sports Illustrated magazine. Very informational and jam packed home page offers you podcast videos, University sports links, and quick links to take you to any of the current sporting event news you want to learn more about. 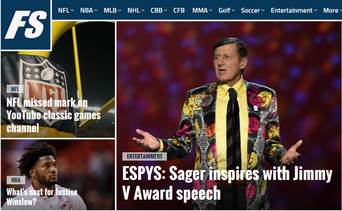 USA Today Sports - Get the top stories in NFL, MLB, NHL, Soccer, etc. right from their home page. Watch clips, videos, and highlights from games you may have missed. Yahoo! Sports - Yahoo! Sports allows you to sign in and save your favorite local teams that you would like to see more news on. Yahoo! Sports has a game of the day for anyone to watch for free. There are top headlines and sports news for any sport you want to keep up on. Yardbarker - This is another sports blog you can try to find out more about the sports rumors, news, videos, discussions, etc. Yardbarker is your guide to the best sports content on the internet -- Thousands of articles are written every day on your favorite sports, teams and players, but only a handful of these articles are worthy of your time. Yardbarker editors and algorithms promote the most interesting and entertaining articles from around the web on the stories in sports you care most about.